"The Washington beltway turned a deaf ear to artists' rights until one guy, one activist, wrote the words "I Respect Music" on an index card and showed it to the world. Now, thousands upon thousands of music makers and music lovers are standing together and making history by adding their names to a petition that is not only shaking up the music world, it's shaking up Congress. The petition, written and launched from the laptop of artist and musician Blake Morgan, has gone viral at an unprecedented pace. 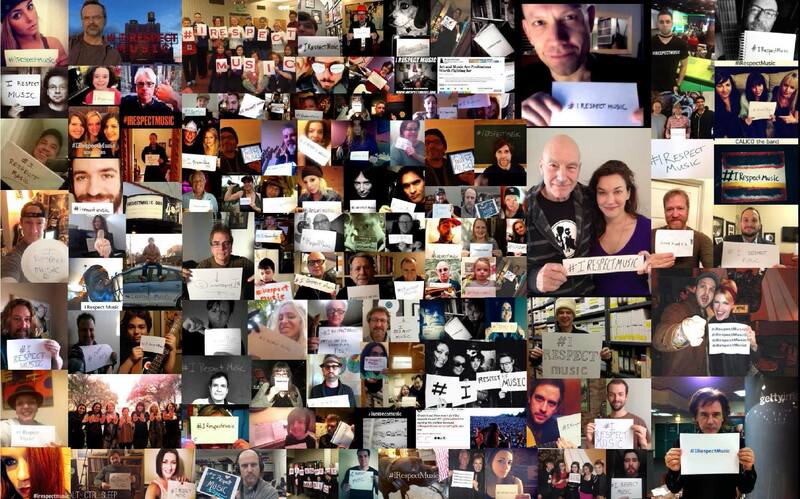 Everyday working musicians, music fans, music organizations, and luminaries like David Byrne, Patrick Stewart, Gavin DeGraw, Jean Michele Jarre, Marc Ribot, Roseanne Cash, Mike Mills, John McCrea, Civil Twilight, Clap Your Hands Say Yeah, and countless others have voiced their support by both signing the petition and posting or tweeting a "selfie" with the hashtag: #IRespectMusic. "The idea for 'I Respect Music' was born in an Op-ed I wrote for the Huffington Post in mid-December," says Morgan (article here). "Once the article went viral and passed 40,000 'likes,' it was clear that idea––and those three words––had resonated far deeper than anyone could have expected." Blake Morgan is no stranger to how democracy works in the modern age, or to winning a David vs. Goliath struggle for artists' rights. The I Respect Music campaign follows his whistle-blowing victory over Internet radio giant Pandora, which led to the multi-billion dollar company abandoning its own signature legislation in Washington which would have reduced artists' pay by up to 85% (article here). "Many are surprised to learn that the United States is the only democratic country in the world where artists don’t get paid for radio airplay. And, that the short list of countries that share the United States’ position on this issue includes Iran, North Korea, China, Vietnam, and Rwanda." Morgan adds, "What's more, as a result of not paying their artists for radio airplay here in the United States, other democratic countries aren’t paying American artists in their countries." "Art is one of the United States' top five exports. It's one of the few things the United States still makes that the world still wants," says Morgan. "So it's not just rock stars who aren't getting paid, we're talking about millions of working class artists and musicians, as well as millions more who are––or used to be––employed through music: electricians, carpenters, bus drivers. This isn't just about music, it's about American jobs, and American exceptionalism." To sign the petition, please visit www.irespectmusic.org."